It was Winter, and the snow lay thick and white on the ground, while the cold wind blew from the north. 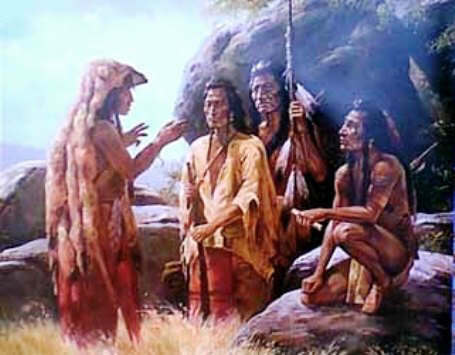 In a village of the Iroquois there was sickness and little food. In the lodge of the handsome young brave Nekumonta, his wife, the gentle Shanewis, lay fading away. And when Nekumonta saw her suffering, his heart filled with grief. "Surely," he cried, "I must find the Healing Herbs the good Manitou has planted! Even if they lie hidden under the snow, I must search and find them!" So he covered his wife with warm furs, and placed what food he had beside her. Then, taking his staff and his snowshoes, he bade her good-bye, and set out on his search. All day long he wandered eagerly through the forest, skimming over the shining white surface. And though he sought everywhere, he could not find the Healing Herbs. The snow lay deep on the ground, and with a soft mantle covered trees and bushes. Not even the tiniest leaf showed above the white covering. Thus for three days and two nights he wandered vainly through the forest. A small, grey Rabbit crossed his path, and he cried, "My little Brother, tell me where the Healing Herbs are that the good Manitou has planted!" But the Rabbit did not answer. It only scurried away, for it knew that the Herbs were still in the Winter ground, and it was sorry for Nekumonta. Then he passed by the den of a Bear, and stopped at the entrance. "My brown Brother," said he, "tell me where the Healing Herbs are that the good Manitou has planted!" But the Bear did not answer, for it was asleep, waiting for the Springtime to come. Then he called to the Deer, as it came leaping through the forest, "My swift Brother, surely you know where the Healing Herbs are that the good Manitou has planted!" But the Deer did not answer, and went bounding away, for it knew that the wind blew too cold for the little Herbs to come up. So Nekumonta called to the Squirrel and the Winter Birds, and to all the other forest creatures, but they gave him no answer. And when the third night was come, he was weary and weak, for he had eaten no food. Despairing, he sank down upon the soft breast of the snow, and soon fell asleep. The Deer saw him and gave the forest cry. Then from the bushes the wild creatures came quietly creeping, to watch over Nekumonta. With their warm breath and thick fur they sheltered him from the cold, so he slept in safety. For the animals remembered his kindness. He had never slain a creature except for food or clothes, and he loved the trees and flowers. "Seek us, oh, seek us, Nekumonta! When you find us, Shanewis will live! Then Nekumonta awoke, and rose to his feet. The animals were gone, for they had slipped away into the forest. No waters were to be seen, but the sound of their murmurings still fell on his ear. "Release us," they seemed to sigh, "release us, Nekumonta, and Shanewis will be saved!" The murmurings seemed to come from the ground under his feet, so he took his staff and dug through the snow and into the earth. Then a hidden spring was disclosed, and gushed from the ground. Its waters went singing joyously down a steep hillside to the valley of the Iroquois below. And wherever they passed the snow melted, and the green grass and flowers sprang up. With thanks in his heart, Nekumonta made a jar of clay, and filling it from the spring, sped swiftly away to his lodge. He poured the Healing Waters through Shanewis's pale lips, and she fell into a health-giving slumber. So the gentle Shanewis was saved, and the Healing Waters brought joy and Springtime to the village of the Iroquois.